To raise much needed revenue for archaeological excavations, reduce the strain of storage and maintenance of artifacts on museums and national heritage agencies and help undercut the trade in illicit antiquities, governments, universities, public museums and related institutions should consider making duplicate, common and unwanted artifacts available to the public for sale. Government agencies responsible for management of archaeological sites and artifacts in antiquities rich countries – nations whose long histories of human occupation have left them with considerable archaeological and architectural remains – have found themselves increasingly pressed to adequately store and preserve the wealth of archaeological materials excavated or accidentally unearthed in their territories. The situation has been described as “a crisis in curation” and that “the problem continues to be widespread and serious” (Kersel 44). Many of these nations once participated in a system known as “partage” under which foreign archaeological missions divided duplicate or similar objects between themselves and national heritage and museums agencies. With the end of European colonialism and a rise in nationalist sentiment in many of these countries, the partage system came to an end and all antiquities stayed in the host nations. This helped fuel the storage crisis (Kersel 48). This crisis is not limited to developing nations rich in antiquities but to economically postmodern western nations as well. At the most recent “Dig It!” conference in London, museum professionals and archaeologists met to discuss the crisis of storage for archaeological collections in the UK. Despite much debate, no practical solutions were arrived at (Sharpe). Just as a crisis exists in storing archaeological materials, another crisis is slowly unfolding for national heritage agencies and research institutions in funding both routine ongoing archaeological excavations and rescue archaeology, and with such basic tasks as maintenance of ancient monuments and the publication of archaeological excavation reports. Sometimes referred to as “archaeology’s dirty secret,” the failure to publish excavation results can be said to reduce archaeologists to little more than looters (Kersel 46). This is true both in antiquities rich Mediterranean and Near Eastern nations, where widespread political instability has frightened away outside funding sources, even in specific countries that have remained stable, and in developed European nations, where national priorities have shifted in light of fiscal belt tightening. “Archaeology in England is in the middle of its worst crisis ever” was the pronouncement in a recent blog entry by a prominent British academician (Nevell). At archaeological sites all across the Mediterranean world and beyond, remains that have been excavated, published and restored over the past century or more have begun to fall victim to official neglect. One site, in particular, has garnered a great deal of attention due to its high profile: Pompeii. Visited by as many as two and a half million tourists and locals per years, the site has suffered extensively at the hands of the very tourists whose revenues support it and through wasteful and indifferent practices by the Italian governmental agency tasked with its preservation. The photographs below make this point very clear. 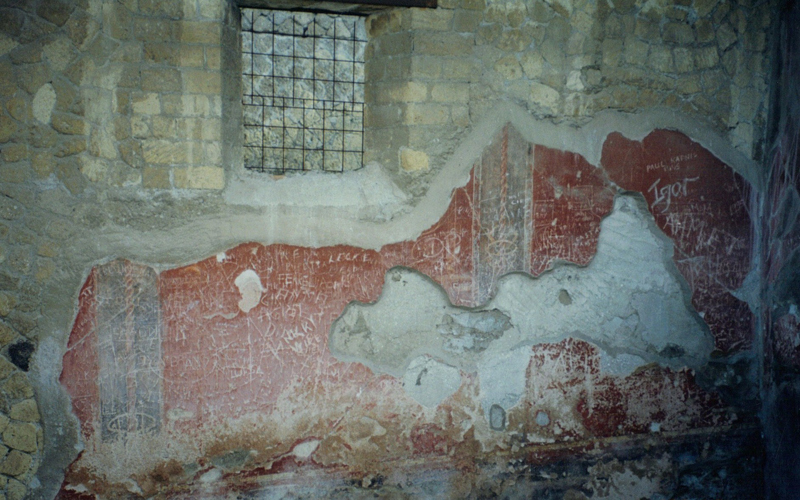 In the first image, a frescoed wall of the mid-First Century AD is shown covered in graffiti scratched into its surface by Italian school children and foreign tourists (Personal photograph). In the second image, a storage pen for excavated materials is open to the weather, allowing complete and fragmentary Roman transport vessels, roof tiles and even a lead cinerary container to slowly crumble due to lack of climate control (Personal photograph). Despite a legal market for antiquities in most European and North American countries, there is also an illicit market, involving the illegal removal of artifacts for profit, and it thrives in times of political upheaval. Egypt, Syria and Iraq have all fallen victim to this practice in recent years. To many people involved in archaeology and cultural heritage protection, the importance of this problem far outweighs the other issues raised above. While evidence suggests that the actual extent of illicit excavation in most countries is not as severe as sensationalist media reports would suggest (Proulx 17-18), there can be no doubt that in times of conflict and political instability the problem is exacerbated. The well-heeled cultural heritage “industry” and the archaeological community have sought to associate this trade (which is primarily carried out by impoverished locals when conflicts impede their livelihoods, and who are primarily seeking precious metals that may be easily transported or melted down) with organized crime on an international scale (Massey 732-33). Both communities have made many imperious pronouncements, seeking to take the moral high ground in the debate over antiquities, but have offered little in the way of practical solutions to this illicit trade. In a 2003 interview, Jane Waldbaum of the Archaeological Institute of America said simply “We do not support a legal trade in antiquities. Period” (Tierney). 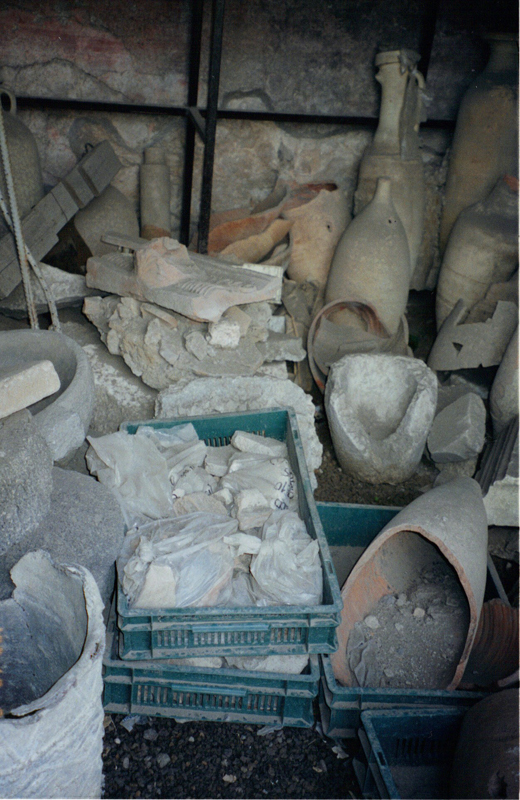 Although the crises outlined above can only be solved through multiple solutions, there is one proposal that can address, at least in part, all of them: Selling, using a carefully monitored and documented methodology, duplicate or common antiquities to help reduce the artifact storage problem, generate much needed revenue for archaeological digs and research by national heritage agencies and universities and help to undercut the illicit trade in antiquities. The assertion that duplicate archaeological objects that have little or no practical research value, after being recorded and placed in storage, could be sold to benefit archaeology, museums and heritage protection is not a new one. It has proven to be a highly controversial suggestion, arousing powerful emotional responses from the archaeological, historic preservation, cultural heritage, museum and antiquities dealer communities. In view of the recent unprecedented acts of religiously motivated destruction of archaeological resources in the Middle East, the continuing decay of World Heritage sites in Italy such as Pompeii and the gradual shifting of financial priorities in most countries away from culture, the arts and heritage, the time has come to examine this idea seriously. The most credible proposal of this type came from a most unexpected source. The late Israeli archaeologist Avner Raban, a highly respected scholar and field archaeologist with forty years experience, rocked the archaeological world in 1997 with an article entitled “Stop the Charade: It’s Time to Sell Artifacts” (42). Raban proposed that Israel and other Mediterranean countries should permit the sale of artifacts from legal archaeological excavations following their publication in scientific journals. Specifically, he proposed that such sales be governed by clearly defined rules that included triplicate documentation of each object (one to the government archives, one to the excavating institution and one to the purchaser) and a prioritization of objects that sent unique items to national or regional museums and less important items to university or other study collections for further research or display. Only the remaining objects might be sold on the legal antiquities market through authorized dealers. To guarantee the items would be traceable for future study, each object would also bear the excavation permit number, a registry number and locus number – the precise location of the find within the excavation (45). The logic behind Raban’s proposal was that objects with such precise documentation, even if they tended to be very common types, would fetch far greater sums on the open market than objects with no clear provenance, a concept that this writer can attest to through personal experience. The revenue thus generated for archaeological projects, storage, display and additional curatorial research would also change the perception of the antiquities buying community from facilitators of looting to benefactors of archaeology. In addition to undercutting the illicit trafficking in such objects, Raban’s proposal would also make it more difficult for forgers to ply their trade (45). Of course, entrenched interests continue to oppose ideas such as Raban’s, the most obvious of these being the professional associations representing the established archaeological community. These special interests cling to outmoded nationalistic concepts of cultural patrimony because doing so facilitates obtaining excavation permits in host countries. In a recent New York Times piece, J. Paul Getty Trust Chief Executive James Cuno addressed the issue of repatriating art and artifacts to nations on the basis of “national identity” claims, which he argues cannot be adjudicated, only debated. He argues that the notion of “cultural heritage” is a construct of modern nation states and therefore not relevant to archaeological context (Cuno). And in a remarkable break with much of the academic community, Sir John Boardman, Emeritus Professor of Art and Archaeology at Oxford University and widely recognized as the world’s greatest living authority on ancient Greek vase painting, posed the question: “So who do these archaeologists think they are, as absolute guardians of the world’s heritage?” (qtd. in “Some Scholar’s Opinions”). He criticizes at length the archaeological community for failure to publish excavation reports, comparing an unpublished excavated site to the destruction of the Bamiyan Buddhas, and for their complicity in supporting, through their silence in the interest of receiving excavation permits, tyrannical regimes in antiquities rich nations. Despite such criticisms, the archaeological community continues to resist any innovative proposals such as Raban’s that might appear to lessen their grip on the past. Since Raban’s original article, similar ideas have been floated again. Herschel Shanks, publisher of Biblical Archaeology Review magazine, said in 2003, following the looting of the Iraq Museum, ”Archaeologists like taking the high moral ground against selling antiquities, but it doesn’t solve the problem of looting. I would like to use market solutions. Sell very common objects, like oil lamps or little pots, and use the money to pay for professional excavations” (Tierney). And at the recent “Dig It!” conference in London, an audience member asked if museums should sell excess material in their shops. The panel unanimously replied in the negative (Sharpe). Despite the resistance, ideas similar to Raban’s may soon prove to be the only viable option for dealing with the issues outlined above. Time, space and funds are running short for archaeologists, museums and the past itself. Kersel, Morag M. “Storage Wars: Solving the Archaeological Curation Crisis?” Journal of Eastern Mediterranean Archaeology and Heritage Studies 3.1 (2015): 42-54. Print. Massey, Laurence. “The antiquity art market: between legality and illegality.” International Journal of Social Economics 35.10 (2008): 729-738. Print. Nevell, Mike. “Archaeology in Crisis.” Archaeologyuos. WordPress, 7 Apr. 2014. Web. Pompeii, Italy. Personal Photographs by Author. December, 2002, JPEG files. “Pompeii to Receive Italy Rescue Fund.” BBC News. BBC, 4 Mar. 2014. Web. Proulx, Blythe Bowman. “Organized crime involvement in the illicit antiquities trade.” Trends in Organized Crime 14.1 (2010): 1-29. Print. Raban, Avner. “Stop the Charade: It’s Time to Sell Artifacts.” Biblical Archaeology Review 23.3 (1997): 42-43. Print. Sharpe, Emily. “An embarrassment of riches: UK museums struggle with archaeological Archives.” The Art Newspaper. theartnewspaper.com, 6 Mar. 2015. Web. “Some Scholar’s Opinions.” International Association of Dealers in Ancient Art. n.d. Web. Accessed 15 Mar. 2015. Tierney, John. “Ideas & Trends: Did Lord Elgin Do Something Right?” New York Times. New York Times Company, 20 Apr. 2003. Web. Thansks! That was an excellent summary of the situation. The archaeologist’s attitudes strike me as similar to closing their eyes and hoping the problem will go away. Hopelessly shortsighted and ineffective.